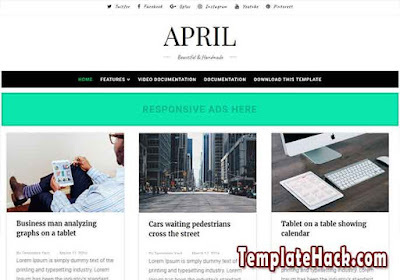 TemplateHack.com - Download April premium blogger template. April is not June or July blogger theme (just kiddig :D). it is free premium blogger template has simple and clean appeal with minimalist design. It is focused on readability and typography. You can use this amazing blogspot template for your movie blog, photo blog, reviews blog, recipe blog, make up blog, travel blog, OOTD blog, sport blog, and any other personal blogger theme. Being a responsive design, it will make this template can load fully on desktop, smartphone, handphone, tablet with any screensize. 3 column,Adapted from wordpress, Elegant, SEO Friendly, Simple, Grid, Ads ready, Wordpress look, Browser compatibility, Responsive, White, Green, Drop down menu, Mobile friendly, Whatsapp, sharing button, Social share button. OOTD blogger template, Travel blogger template, Personal blogger template, Make up blogger template, Recipe blogger template, Reviews blogger template, Movie blogger template, Food blogger template, Photography blogger template, Sport blogger template, Reviews blogger template.